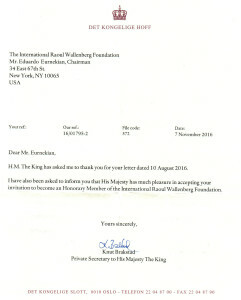 Through a letter addressed to Eduardo Eurnekian, Chairman of the Raoul Wallenberg Foundation, His Majesty, King Harald of Norway accepted to become an Honorary Member of the NGO founded by Baruch Tenembaum. 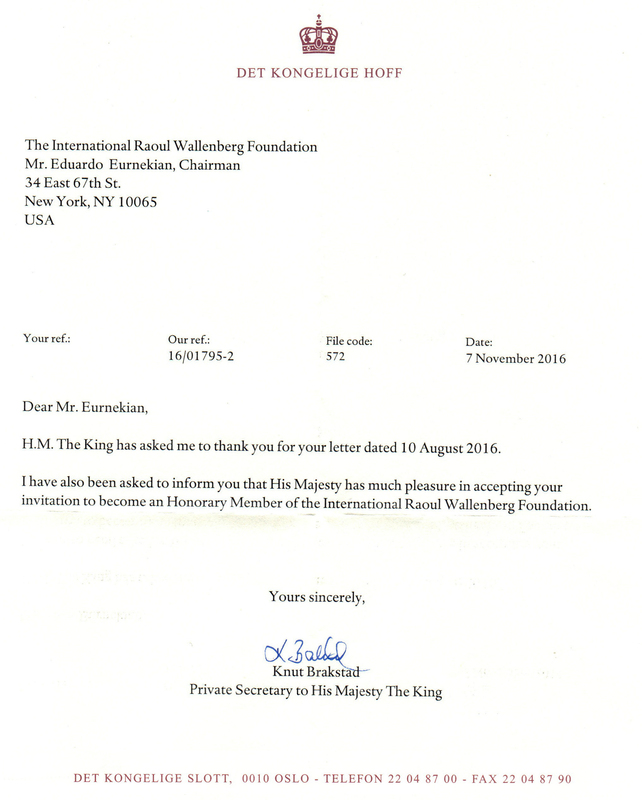 More than 300 Heads of State and Nobel Laureates support the mission of the IRWF. Jorge Mario Bergoglio, Pope Francis, is one of its founding members. Sixty-two Norway individuals were honored with the title “Righteous among the Nations” for saving the lives of persecuted Jews during the Shoah. His Majesty King Harald V of Norway was born on 21 February 1937 at his parents’ home, the country estate of Skaugum, near Oslo. The only son of Crown Prince Olav (the future King Olav V, 1903-1991) and Crown Princess Märtha (1901-1954), he acceded to the Throne when his father passed away on 17 January 1991. Prince Harald was the first prince born in Norway in 567 years. Crown Prince Olav and Crown Princess Märtha also had two daughters, Princess Ragnhild and Princess Astrid, both born before the Prince. At the time, the Norwegian Constitution of 1814 stipulated that only male heirs could inherit the Throne. Thus, the birth of Prince Harald guaranteed the line of succession. The Constitution was amended in 1990, and it is now the oldest child, regardless of gender, who accedes to the Throne. In connection with the entry into force of the new amendment, a decision was taken to apply the previous rule to all children born prior to 1990. The first three years of Prince Harald’s life were spent in the peaceful surroundings of Skaugum. However, this came to an abrupt end on 9 April 1940, when German troops invaded Norway. To avoid being taken into custody by the occupying forces, the Royal Family, the Government and most members of the Norwegian Storting escaped from Oslo by train. When they reached Elverum, Crown Prince Olav and his family parted company. Crown Princess Märtha and the three children, Princess Ragnhild, Princess Astrid and Prince Harald, fled to safety across the border to Sweden. After several months in Sweden, the Crown Princess and her children travelled to the USA by sea. While King Haakon and Crown Prince Olav stayed in London, the Crown Princess lived with the children in the outskirts of Washington, DC, until 1945, when peace was declared. Crown Prince Olav returned to Norway on 13 May 1945, where he was joined by King Haakon and the other members of the Royal Family on 7 June. The homecoming of the Royal Family was celebrated by thousands of cheering spectators who lined the streets to welcome them back after five years of occupation. After the liberation, Prince Harald attended Smestad school in Oslo. Aside from the presence of a security guard stationed in the hall, the Prince’s school years differed little from those of the other children. To enable the Prince to comply with the demands of a modern monarchy, his upbringing emphasised the importance of close ties to the Norwegian people and contemporary society. Prince Harald completed his upper secondary education at Oslo Cathedral School, receiving his school-leaving certificate in 1955. Prince Harald entered the Norwegian Cavalry Officers’ Training School and went on to finish his military education at the Military Academy in 1959. Upon completion of his compulsory military service, the Crown Prince went to Oxford for further study. He attended Balliol College from 1960 to 1962, studying social science, history and economics. King Haakon VII died on 21 September 1957, and Prince Harald became Crown Prince, attending the Council of State for the first time. The following year he acted as Regent in the King’s absence for the first time. The Crown Prince worked closely alongside his father, King Olav V, and carried out an increasing number of official tasks, such as travelling with trade delegations to promote Norwegian industry abroad. In 1960 Crown Prince Harald made his first official state visit abroad, travelling to the USA in connection with the 50th anniversary of the American-Scandinavian Foundation. In March 1968 it was announced that King Olav had given his permission for the Crown Prince to marry Miss Sonja Haraldsen from Vinderen in Oslo. The couple had known each other for nine years before their marriage was approved. The decision to be taken by the King was not only a family matter, but also an affair of state that could have implications for the future of the monarchy. After consultations with the Presidium of the Storting, the parliamentary leaders and the Government, the King gave his consent for the Crown Prince to marry a commoner. The wedding was held in Oslo Cathedral on 29 August 1968. The newlywed Crown Prince and Crown Princess were received with great jubilation by people throughout the country. The Crown Princess assumed her share of the official duties. King Harald and Queen Sonja have travelled extensively in Norway and abroad, both together and separately. They have two children, Princess Märtha Louise, born on 22 September 1971, and Crown Prince Haakon, born on 20 July 1973. When King Olav fell ill in the spring of 1990, the King’s functions as Head of State were filled by the Crown Prince Regent. In accordance with the Constitution, Crown Prince Harald acceded to the Throne when King Olav passed away on 17 January 1991. 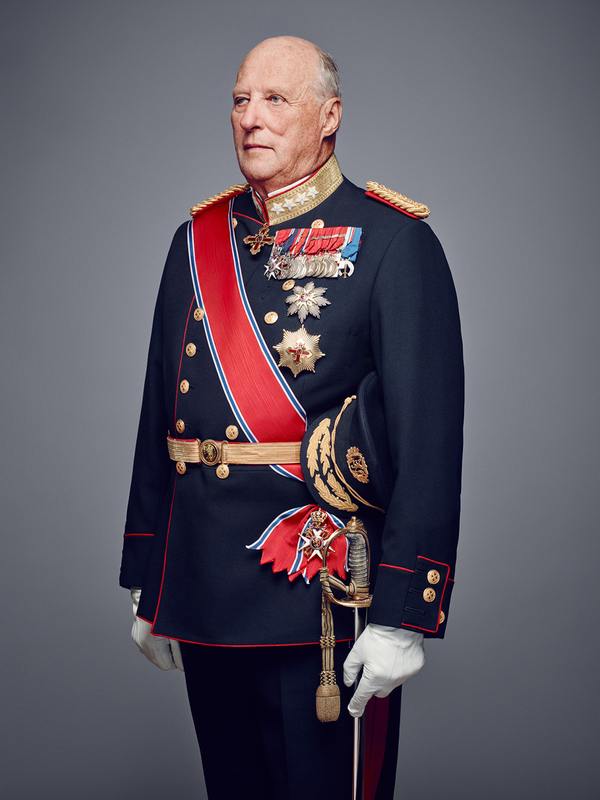 Like his father and grandfather before him, King Harald adopted the motto “We give our all for Norway.” Four days later, King Harald swore an oath to uphold the Constitution in the Storting. The ceremony was also attended by Queen Sonja, marking the first time in 69 years that a Norwegian queen had been present in the main chamber of the Storting. In accordance with their own wishes, the King and Queen were consecrated in Nidaros Cathedral in Trondheim on 23 June 1991. The consecration of Norwegian kings dates back more than 1,000 years in Norway, and was previously carried out during the coronation of a new monarch. In 1908 the Storting repealed the article in the Constitution relating to coronation. King Olav, who was keenly interested in maintaining traditions, expressed a desire to take part in a consecration ceremony in Nidaros Cathedral, and thus to receive God’s blessing for the performance of his royal duties. King Harald and Queen Sonja wished to continue this tradition and chose to hold a consecration ceremony in the same cathedral. Bishop Finn Wagle presided over the ceremony. In connection with the consecration, the King and Queen conducted a 10-day tour of Southern Norway. The following year, the entire Royal Family conducted a 22-day tour of Norway’s four northernmost counties.